During our consultation with the clients we talk about things the couple do together and how we can incorporate activities into the wedding day photo process. Its not real hard to guess what they like to do. So we do it. Turned out to be a lot of fun and everyone at the location let us get the shot. We find that most people are very accommodating for wedding parties and long as people are not intrusive. Unique Moments Photography always scouts locations and we like to ask for permission rather then beg for forgiveness. 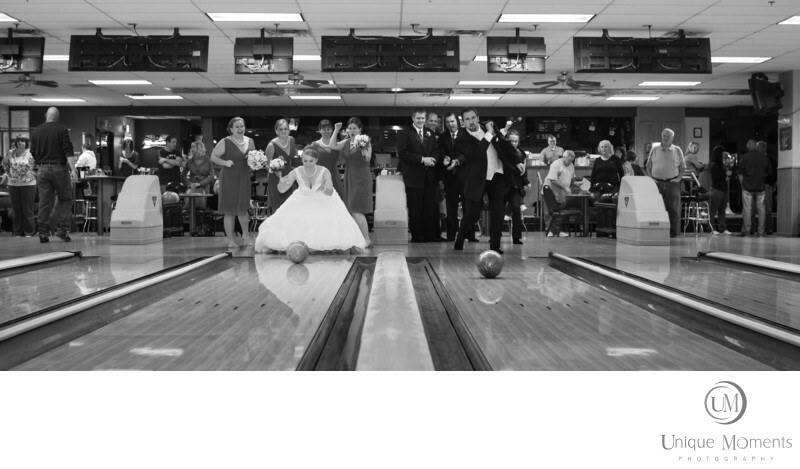 This company was more than happy to let them toss a few balls and enjoy some drinks at the bar before heading off to the reception. Fun Times, Fun Shot. Thats what its all about.